A quick way to make handmade Thanksgiving cards are to use seasonal stickers. During the fall you will find lots for stickers with turkeys, pumpkins and leaves. Browns and oranges usually dominate the color schemes. Below is a really simple card to make. I took a busy pattern paper for the top half and a milder print for the bottom half. For my Happy Thanksgiving cards, I bought a seasonal paper stack that had several coordinating prints and stripes which made card making easier. Of course for autumn colors, the pack consisted of yellow, brown, orange and green colors. I used the brown, yellow and orange colors. The turkey sticker came from a sticker pack and included the acorn. I embellished the card with yellow adhesive gems. 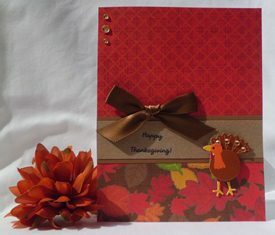 My cardmaking ideas are often inspired by stickers so a small pack of Thanksgiving stickers were the perfect match. And since the pattern on the paper was so busy, I didn't want to inundate the card with lots of embellishments so I used only a couple of stickers from the pack. That way, I could save the other stickers to make more homemade Thanksgiving cards. For many of my paper card making ideas, I create the sentiment on my computer and print it out on my laser printer and for this Thanksgiving day card, I printed the sentiment on a clear label sticker. You can find the clear label stickers at your local office supply store. To finish off this Thanksgiving greeting card , I added yellow adhesive gems on each end of the yellow paper strip. 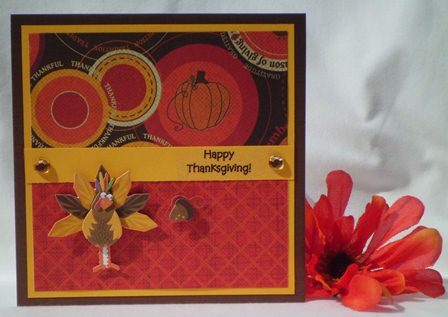 Here are more examples of handmade cards for Thanksgiving. For these cards, I used the same paper stack as the Thanksgiving Day card above. This card below utilized the orange and brown color scheme. What's great about using a paper stack is that you can combine the prints easily since the color palette matches. Again, as with my handmade card making project above, I used my laser printer to make the sentiment and printed it on a clear label sticker. I helped embellish the card with adhesive rhinestones, a brown satin ribbon and a turkey sticker. Another handmade Thanksgiving card idea is this one above, again, using the same paper stack as the cards above. I used a sticker of a sunflower and one that said "Happy Fall" from the same pack. Using my border punch, I punched a strip from brown paper. To finish off the card, I tied a knot from brown satin ribbon. 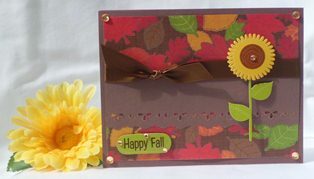 I use this design on many of my handmade card ideas because it is a versatile design. Making Thanksgiving day cards doesn't have to be nerve racking. Look for stickers or pattern paper for inspiration to start making cards.